My first craft post has had to wait a little while, because it was a gift for someone, and I had to give it before I could write about it. 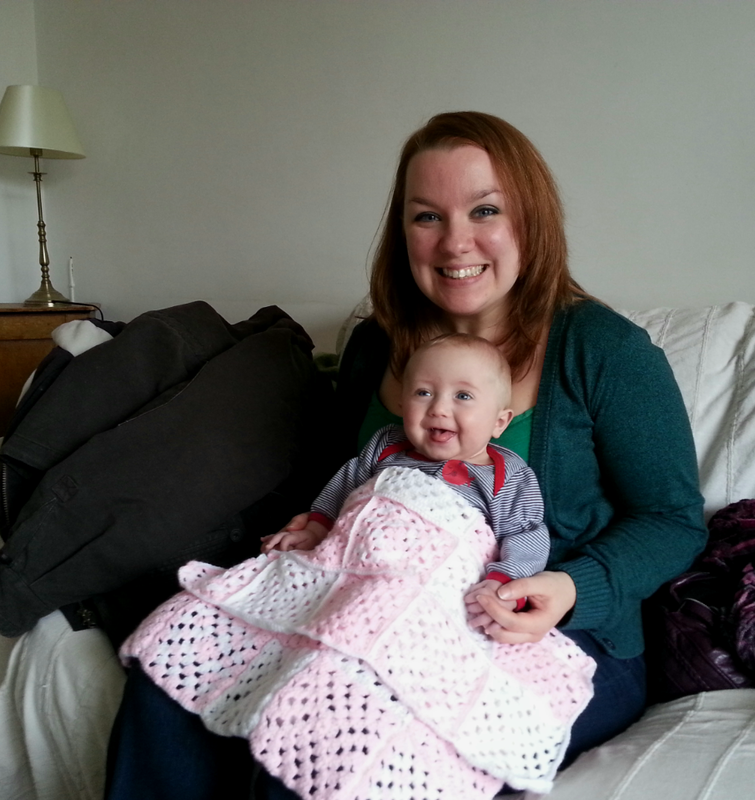 A dear friend of mine gave birth to her first baby girl in August, around the same time that I started to learn crochet. Rather than buy a gift, I decided I would crochet something. Thoughts of hats and booties were quickly dismissed – I was just learning the stitches and I wanted something that would be simple to do. A blanket was perfect – I had picked up granny squares very quickly, so I could make a blanket from lots of small squares. 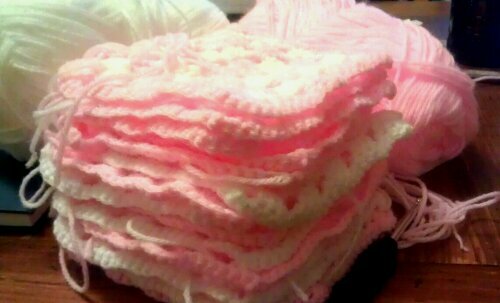 I chose the very stereotypical pink and white as colours, and crocheted 10 squares in pink, 10 in white and 10 in a mix of the the two colours. 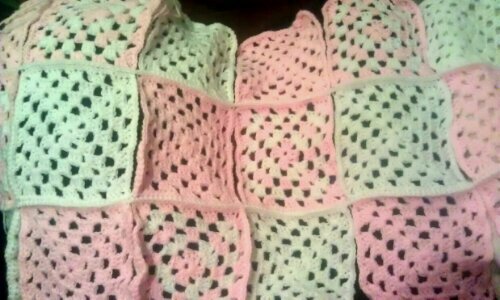 Each square is made up of 5 rounds of treble crochets with a double crochet border, and all the mixed squares start and end in pink. I used a 4mm crochet hook, and Wondersoft 4 Ply yarn by Stylecraft (petal pink and snow white). Once I had finished all 30 squares, I began to work on a pattern. I decided to alternate the squares over the 6×5 rectangle, so the top row was Mixed/Pink/White/Mixed/Pink/White. 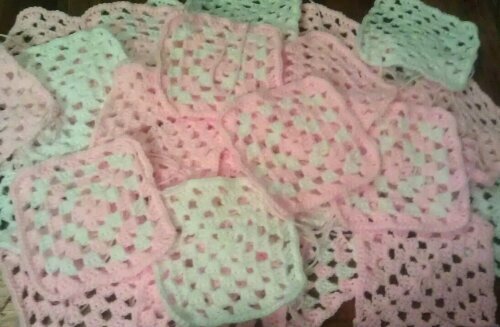 I shifted the squares to the left for the next row down, making it Pink/White/Mixed/Pink/White/Mixed. This continued for all 5 rows. 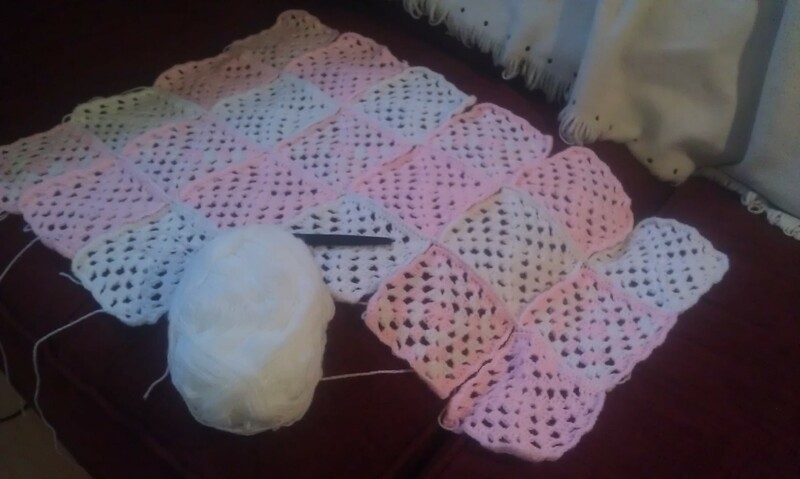 To join the squares together, I used a double crochet stitch in white. Holding two squares back to back, I double stitched the outside loops of each square together along one side, creating a pretty ridge between the squares. I added two squares at a time, and just kept going until I reached the end of the row, then fastened off to start the next row. I joined the first row of squares to the row below, then each row in turn. Once all 30 squares were joined together along the horizontal, I rotated the blanket 90 degrees, and repeated the process along the vertical edges. Once all 30 squares were joined together on all sides, I stitched a border using double crochet, also in white. 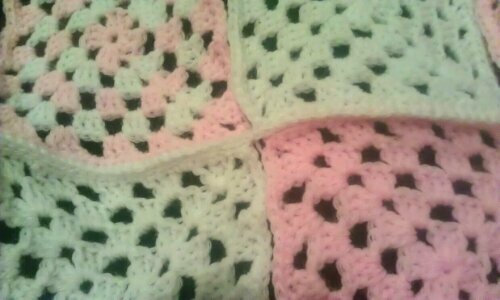 Once I’d tidied up all the loose ends, the blanket was finished and ready to give to my friend and her lovely baby girl. I hope it keeps her warm!